Facebook now offers the ability to promote a post on a Facebook page to your audience for either $5 or $10. The main idea is to pay to increase exposure to the post. This is done by making sure it shows up in the news feed of individuals who ‘Like’ your page as well as increase exposure to their friends if they interact with your post. Pay a little, get a little more exposure to your existing fan base. Here’s what happened for me. I ran two promoted posts with the exact same content on two pages I run: NovelRank and Dice Candies. They have 900+ and 400+ Likes, respectively. The latter has a very regular amount of user engagement and thus has a much higher exposure and interaction rate for posts. That being said, here were the results. Since promoted posts are live for up to 72 hours and this was tested starting early Saturday morning, the promoted post was able to get the attention of a weekend Facebook audience, which is typically less active than during the week. 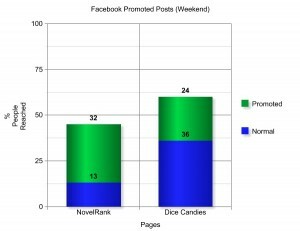 NovelRank had 32% of individuals interact with the posts through the promotion, making up 71% of the total exposure of 45%. This resulted in 13 Likes and 2 comments on the post itself, where typically I would have no comments and 1 or 2 Likes. To put it another way, because of the promoted post payment, it increased exposure to the audience by 248%! Dice Candies had 24% of individuals interact with the post through promotion, making up 40% of the total exposure to 60% of the audience. This resulted in 12 Likes and 2 comments which is roughly a two-fold increase on interactivity for this type of post, especially on a weekend. The effect was to increase exposure by 140%, a much lower impact than with NovelRank. Did it help? Yes. Is it worth $5? The bigger your audience, the easier it is to say yes. If you are a major brand with 10,000+ page Likes, then increasing exposure is well worth the $5 (or $10) investment, especially on a weekend post. The key differentiator is to determine what benefit you are gaining for promoting this post. If there is a special promotion to sell products, a single extra sale would more than make up the difference in cost. However, the costs can vary up to $300 depending on your audience size, so this requires individual testing. In my test, I was promoting a brand message: We do good things for charity. Was it worth the $10 to bring that brand message forward? Yes for NovelRank, no for Dice Candies. Did it result in any donations to that charity? No. So here in lies the rub. While exposure and engagement increased, it doesn’t always mean that you will garner more interaction outside of Facebook, which is the problem I have with Facebook Ads in the first place. Promoted posts are great at brand awareness and engagement within the platform, but not a great opportunity for external interaction; further testing is required. Finally, if you have an active Facebook page with a large amount of interaction and a steady stream of useful posts to engage your users, then promoted posts will have diminishing returns. After all, you are paying someone in time and/or money to build up an attentive audience, so a promoted post is more effective on a page where you do not have a strong presence. The site HasOffers did a write-up of their experience with Facebook promoted posts and compared it to an standard Facebook ad, just in case you want some more opinions. This entry was posted in Marketing and tagged advertising, Facebook, promoted posts on July 3, 2012 by Mario Lurig.